I am just home from an 8 day trip through the states of Oklahoma, Arkansas and Tennessee. My trip included lots of cookie decorating, meeting with “internet friends”, and so much chatting that by the end of the week I had no voice! I’ll look forward to sharing some of the details of my trip very soon, but for today I’ll share these fun and simple Halloween Cupcakes in a jar. If you’ve been around (Glorious Treats) for any time you may have figured out that I like (maybe love!) 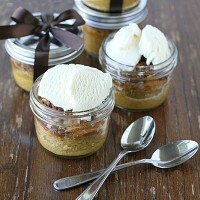 desserts in a jars! 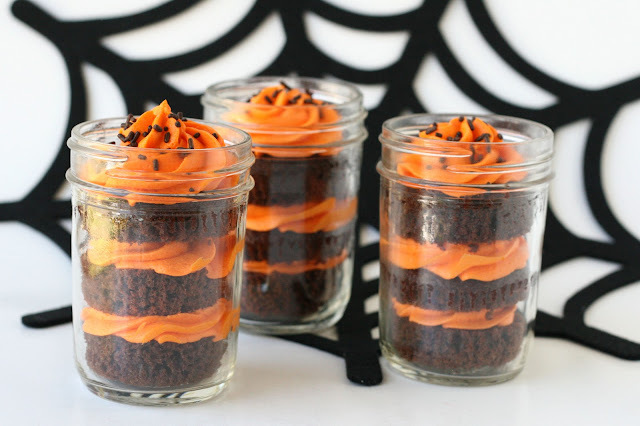 First there were the cute and simple Chocolate Cupcakes in a jar, then festive 4th of July Cupcakes in a jar, followed by Orange Dreamsicle Cupcakes in a jar, and recently Pumpkin Pecan Dessert in a jar. 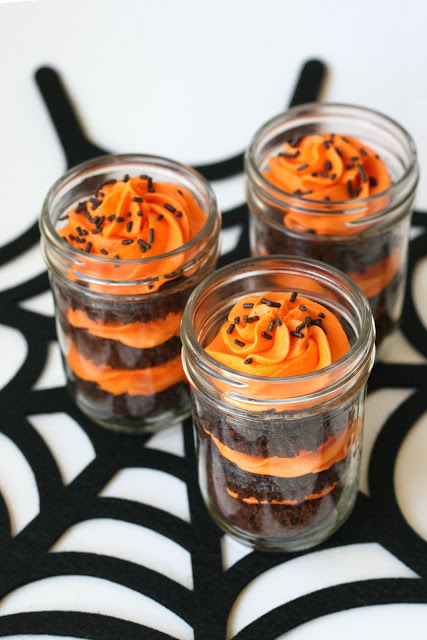 Layering cupcakes or desserts in a jar is such a great way to add some pizazz to an individual serving of dessert. They make great gifts or party favors and are easy to transport… what’s not to love? 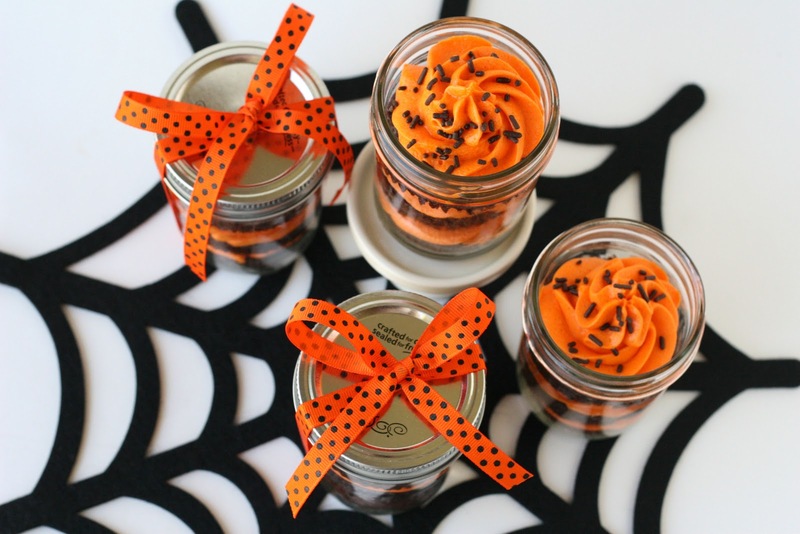 Each time I post a treat in a jar I get questions as to where I buy my jars (even though I do mention it in each post)… I usually buy my jars at Wal-Mart or my local grocery store. I’m sure you could also buy them on-line. These cupcakes are layered in 1/2 pint canning jars. 1. 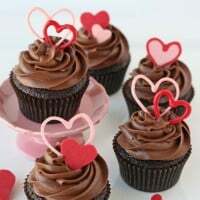 Bake Chocolate cupcakes (here’s my favorite Chocolate Cupcake Recipe) in standard sized paper liners. 2. 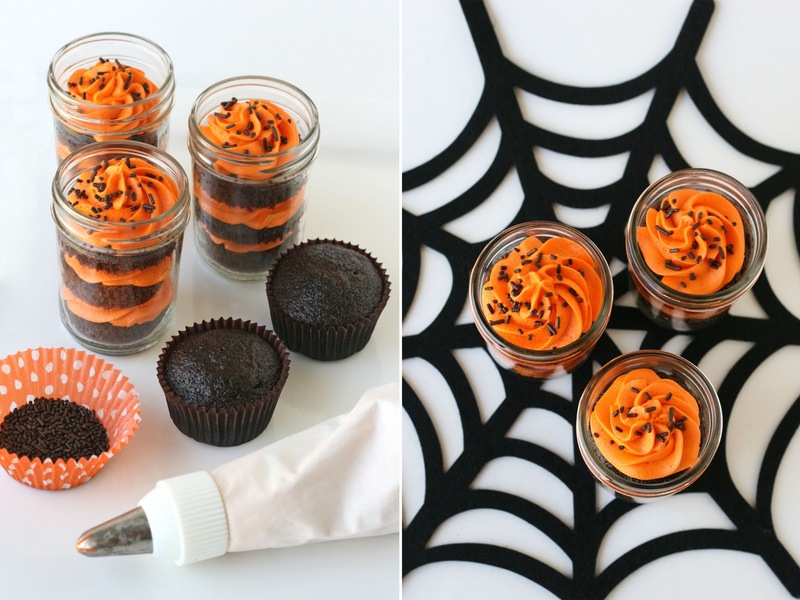 Once the cupcakes are baked and cooled, remove paper liner, and cut cupcakes in half (horizontally). 3. Prepare a batch of frosting (I used my Vanilla Cream Cheese Frosting), and color the frosting as desired (in this case, orange). Fill a piping bag fitted with a large tip (I used a Wilton 1M) 2/3 full with icing. You could also simply fill (2/3 full) a large ziplock type bag, and cut off one corner. 4. 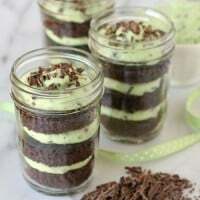 Layer the cupcakes and frosting in clean jars, starting with a cupcake half, then frosting, until there are three layers of cupcake, and three layers of frosting. 5. Top with sprinkles if desired. Serve jars open, or top with lid. 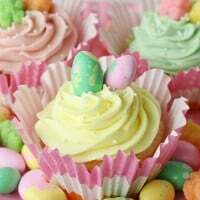 As with most baked goods, these are best the day they are made, but can be stored (covered with lids) at room temperature, or in the refrigerator for up to 3 days. If you’re using the recipes I’ve linked above you’ll be able to make about 16 jars. These cupcakes were featured in the beautiful fall issue of The Party Dress Magazine, available as a paper copy for purchase (here), or veiw the full magazine on-line (here) (find these cupcakes on page 36).